Whether lounging by the pool, perched on your balcony or snuggled in bed; a cruise holiday provides ample opportunity to immerse yourself in that book you’ve long been meaning to read. Looking for some literary inspiration? Cruise1st can help. 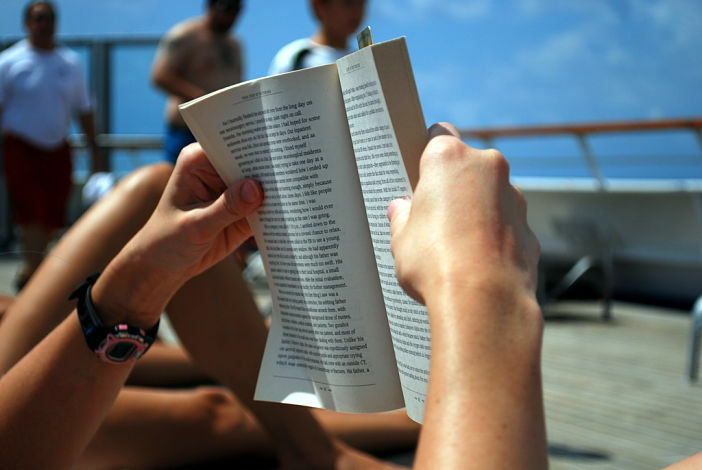 We’ve scoured the web and picked through our favourite reads to bring you a list of twenty books that would prove the perfect companion on your next cruise holiday. Nurturing a nest of eager bookworms? Slide any of these books into your suitcase, and you won’t have to worry about keeping your little darlings entertained. Thanks to its nautical theme and overriding sense of adventure, Julia Donaldson’s The Snail and the Whale is an ideal read for pint-sized cruisers. Featuring the unlikely pairing of – you guessed it – a snail and a whale, this moving tale transports the reader from icebergs to volcanoes via thirty-two beautifully illustrated pages. Let your little one’s imagination run riot by letting them loose on Pippa Goodhart’s endlessly clever book, You Choose! This aptly named hardback promises young bookworms they can “be anyone”, “go anywhere” and “do anything” within the book’s colourful, often whacky pages. How? Witty questions and stickers prompt the reader to cherry-pick from a plethora of possible outcomes. Take it from us: this will keep them busy long after the return leg. Classic Wilson, with a twist; Happy Holidays will envelope children in the complete holiday experience thanks to a series of puzzles, activities, short stories and facts. Somehow, Jacqueline Wilson manages to reproduce the excitement of summer in print form, making it perfect for young readers basking in the heat aboard a cruise ship. Bold, adventurous and set in our own backyard; Michael Morpurgo’s classic children’s novel, Kensuke’s Kingdom, tells the story of Michael – a young kid washed ashore on a Pacific Island after falling from his parents’ yacht. Struggling to survive, Michael soon realises he is not alone, and an exhilarating adventure rapidly unfolds. Have the colouring pencils to hand upon embarkation, for Lost Ocean: An Inky Adventure, will keep the kids busy from dawn ‘til dusk. With eighty pages of beautiful, aquatic illustrations to shade in, this will doubtless be the most memorable colouring book your little ones have ever scribbled on. If you’re struggling to tear your bad-tempered teen away from their smartphone during your cruise, plonk one of these publications in their lap and make Facebook a thing of the past. Part serious novel, part quirky light read; Jennifer Niven’s All the Bright Places is the story of Theodore Finch and Violet Markey – two chalk and cheese characters whose lives collide in unforeseen ways. Despite its dark theme, youngsters will doubtless feel bowled over and connected to the book’s protagonists in equal measure. Aside from its inventive plot, likeable heroes and equally dislikeable villains, Louis Sachar’s Holes is a stylishly penned and altogether cool novel; the kind your kid will leave in full view of their peers. Holes tells the story of Stanley Yelnats, an unlucky soul incarcerated in Camp Green Lake Juvenile Detention Centre where he’s made to dig holes for reasons initially unknown. Meet Garvie Smith – arguably the coolest, most relatable teen detective of all time. With a bulging IQ wasted on standard schooling, Garvie has a classic slacker attitude – until one of his classmates turns up dead, that is. Full of mystery and suspense, Running Girl delivers all the tropes of a classic detective novel in a fun, teen friendly format. With the big-screen adaptation set to hit cinemas over the coming weeks, John Green’s Paper Towns will likely be this year’s must-read book for the trend-conscious teen. Detailing the trials and tribulations of lovesick high schooler, Quentin Jacobsen, Paper Towns is a funny, moving book that’s sure to be loved by all. OK, here’s the “one everyone’s been talking about moment”. Veronica Roth’s Divergent has proved quite the phenomenon – garnering an avid following before being reproduced for the silver screen. The first in a three-part series, Divergent follows the story of Tris on an epic quest to find out where she truly belongs. All that peace and quiet got you feeling thoughtful, pensive and reflective? Dip into this selection of equal parts intriguing and absorbing non-fiction to keep that grey matter ticking. Dubbed the “most important book for a decade” by one keen reviewer, Susan Cain’s Quiet explores the power of quiet, introverted folk in an increasingly noisy, boisterous world. Chock-a-block with insight, facts and entertaining stories, Quiet is a must-read for shy cruise-goers overwhelmed by the volume of their fellow passengers. Now a motion picture (that we also recommend), Tracks tells the real-life tale of Robyn Davidson, an adventurous Aussie struck dumb by wanderlust after the death of her mother. Investing the help of a caravan of camels, Davidson sets out on a 1,700-mile trek across the sweltering Australian desert on a life-changing journey of self-discovery. As alluded to in the title, Paddle Your Own Canoe is a self-help book aimed at the most manly of gentlemen – or those just in need of a good laugh. Penned by Nick Offerman – star of US sitcom, Parks and Recreation – Paddle Your Own Canoe is a funny, inspiring book that’s as hilarious as it is genuinely insightful. If experiencing the work-free side of life has got you reassessing your career, goals and general existence, Shaa Wasmund’s Do Less, Get More could prove a valuable, life affirming read. Combining simple tools with practical ideas, Do Less, Get More has the potential to change your life from the comfort of your sun lounger. If you’ve ever visited the States, chances are you’ll have flown to an airport named after Louis Zamperini – a US airman and famous distance runner imprisoned in Japan during the Second World War. His inspirational story of survival and redemption is told in Unbroken, a biography written by Laura Hillenbrand. With unflinching detail and a gripping plot, you’ll likely have it read before you’ve embarked. If you like nothing more than flicking through a page-turner or tackling a thought-provoking classic, these brilliant works of fiction could be just what you’re looking for on your next seafaring sojourn. Bleak it may be, but Cormac McCarthy’s unflinching modern classic, The Road, remains a best seller a decade after its release. Full of action, drama and suspense, this post-apocalyptic masterpiece is as violent as it is moving, and will leave even the pluckiest cruise passenger blubbing into their Mai Tai. Much has been made of Harper Lee’s long awaited sequel to Kill a Mocking Bird, Go Set a Watchman. Set some years after the events of Lee’s Pulitzer Price winning debut, Go Set a Watchman returns to Maycomb, Alabama to re-examine the lives of its town-folk in an era not yet at peace with the past. Bittersweet, witty, intelligent, brilliant – these are but a few of the words used to appraise David Nicholls most recent book, Us. Following the lives of one family torn apart by change, Us is a funny, moving and altogether touching book that will appeal to cruisers young and old. Tucked away in a genetics lab at the University of Melbourne, Don Tillman develops a scientific test to find the love of his life. So begins The Rosie Project, an original, endearing and often hilarious book about finding love no matter what the cost. For those yet to read Raymond Chandler’s The Big Sleep – what are you playing at? Arguably the best detective tale ever penned, The Big Sleep is a slick, stylish read that’s difficult to put down. Featuring the world’s coolest protagonist, Phillip Marlowe, The Big Sleep is a must-read novel whether you’re at sea or on dry land. Want to read one or two of the above books but are yet to book a holiday in which to do so? Visit the Cruise1st Australia homepage, where we list hundreds of cheap cruise deals and upcoming holidays. Images sourced via Amazon and Flickr Creative Commons. Credit: Amazon and Donnie Ray Jones.